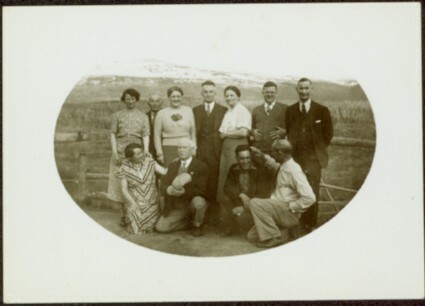 Group of eleven men and women stands and kneels in front of fence, field and hills in background. Sarah stands third from left, Bert stands on far right. Illegible annotation on recto of photograph: "Sands. Life up. Govt Agent [...?] Sands." Image cropped to oval shape. Similar group also featured in items 2009.5.2.274 - 2009.5.2.294. Item is part of the Taylor-Baxter Family Photograph Collection. See also items 2009.5.2.278 - 2009.5.2.281 for images featuring similar content.